Sculptural ceramic shapes in zingy colours by Merete Rasmussen, part of the Future Heritage exhibition, at Decorex. This year's London Design Festival spanned nine days and a multitude of venues and, as ever, there was way too much to see. Instead of freaking out over choice paralysis, my attitude was this: pick a few things, talk to people, have a laugh and roll with it. It is a festival after all. So here's a very personal selection of highlights as observed through my camera phone and in scribbled notes. I definitely took more pictures of things I saw near the start of the week, as opposed to the end. Taking ordinary to extraordinary was this ceramic typewriter, part of Future Heritage at Decorex, made by Katharine Morling. Check out the ceramic pencils in pencil pot too - I'm sure it was much instagrammed, and rightly so. Ghostly, otherworldly glass by Enemark and Thompson, again from Future Heritage at Decorex. The exhibition, curated by journalist Corrine Julius, put the spotlight on craftsmen working at the top of their game and creating the antiques of the future. Could not resist these crazy spoons/vessels by silversmith David Clarke at Future Heritage, they have a generosity about them. It is always a pleasure to see a bit of artfulness in action, also at Decorex. Not me, that's my friend Laurence who accompanied me to Decorex. Outside the main event was a modular structure called Bert's Box, by Bert & May, with a beautiful meadow garden planted by RHS Young Gardener of the Year finalist Josh Chapman. I'll be honest it was the plants that caught my eye. I had the honour of attending an event at the Norwegian Ambassador's Residence in Kensington with Nadja Swarovski and designer Kim Thomé to celebrate the Zotem installation at the V&A during the London Design Festival. It was a bit of an upgrade on my usual Friday lunch. That's Nadja talking to Kim. One word: candelabra. This was truly brilliant. Barnaby Barford's Tower of Babel at the V&A - a monument to the British love affair with shopping made of 3,000 bone china London shop fronts. All are available to buy (natch) the cheaper streets are at the bottom with Bond Street and Regent Street at the top. It's on show until 1st November. I loved this marble cloak, also at the V&A, which blends in with the marble staircase. It was part of an imaginative site-specific installation called The Cloakroom by Faye Toogood (and you can see the Zotem in the background). 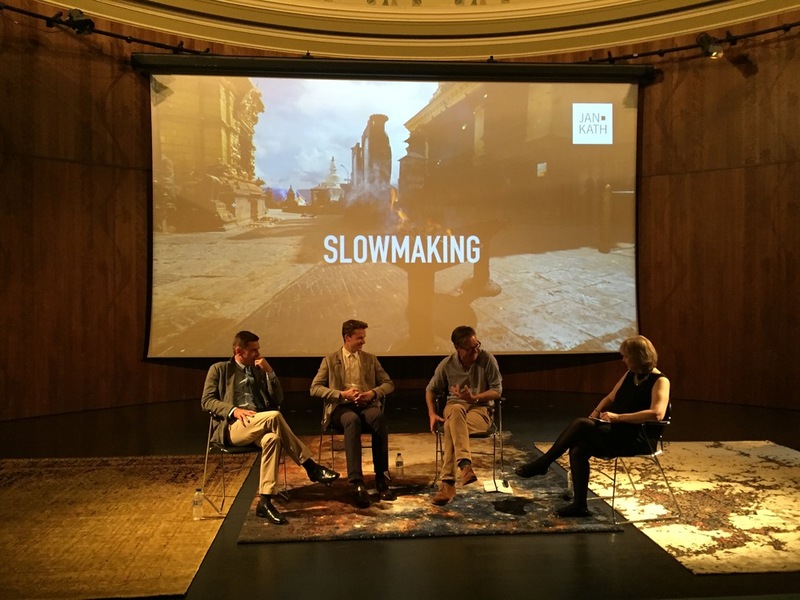 There was a talk at the V&A about 'Slowmaking' featuring rug maker Jan Kath (left), interior designer Daniel Hopwood (second from right) and journalist Helen Chislett (right). Kath produces rugs which are basically works of art and can take around 6-8 months to make. If you've got time there's a lovely National Geographic style video of the hand-crafted Nepalese rug-making process, very chillaxy soundtrack. The delightful Tomoko Azumi at the Margaret Howell shop on Wigmore Street where she was launching her beautiful beech bentwood chair called Flow. 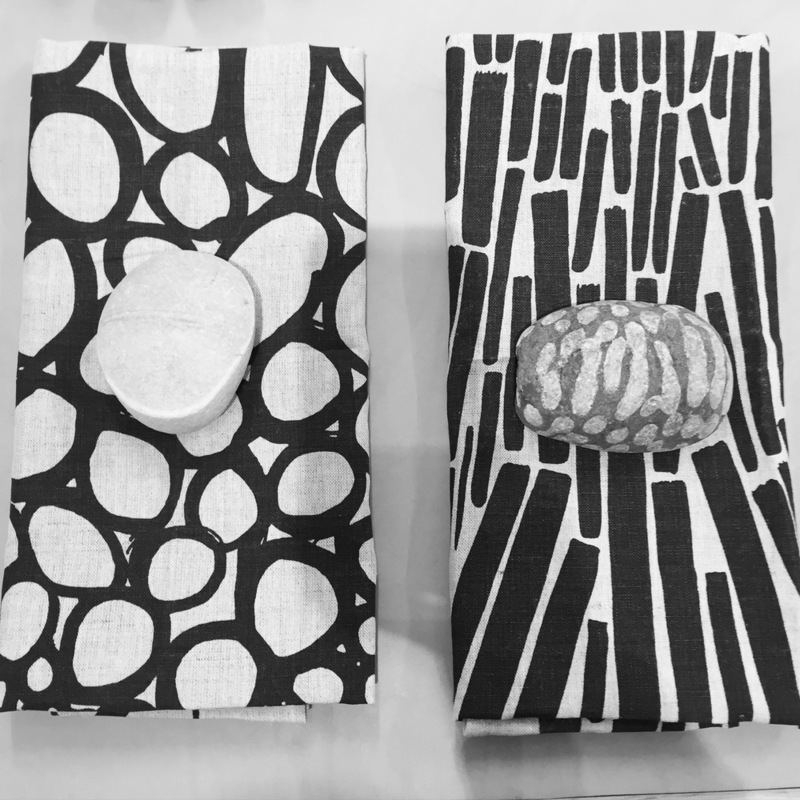 Design and Crafts Council of Ireland put on an evocative show called 'O' which means 'from' in Irish at Tent London which featured beautiful, tactile, hand-crafted items, including these textiles by the talented duo Superfolk. Saw this show in Milan, but I enjoyed it just as much a second time. Constancy and Change in Korean Craft, also at Tent London, showed work by 23 artists under the theme of simple, calm, subtle. The wild and stormy Nim coffee table by the London-based husband and wife design team Pinch deserves a special mention. It's made of Jesmonite, a moldable composite which is safer than fibreglass and lighter than cast concrete. The smartphone backlash has begun... with the launch of the MP01 from Punkt, a mobile phone which only calls and texts, old school style. Punkt's mantra is: 'one device one function'. I love the idea of not being in thrall to my smartphone, but I'm not sure how I'd fare without it. They talk about the MP01 as a training device, ie use it in the evenings/weekends, take it on holiday so you can stay in touch, but it stops you checking your emails all the time - and pack a real camera. I sort of feel we should blame the workman, not the tool, but I get where they're coming from. And finally, I overheard someone say that Shoreditch is like Brooklyn and this may be why: the Mast Brothers chocolate factory shop/gallery (and beard-fest) on Redchurch Street. Made me smile, but the chocolate is amazing.